You surely don’t want to work in silence, right? It’s not like you would want to listen to other people in the workplace either, what with some people not having much to say. That’s where a jobsite radio can come in handy. Whether you are in a traditional office, a construction site, or even a warehouse, you can utilize a worksite radio to help you and others in the workplace enjoy something fun. But not all worksite radio models are alike. 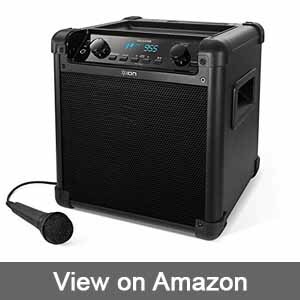 You will have to review a few choices for helping you to find the best sounding jobsite radio so you and others in the workplace can enjoy a little entertainment while on the job. A radio is designed to be easy to use. What Is a Jobsite Radio? A jobsite radio is a portable radio item that takes in over-the-air signals and plays them back like on any traditional boombox. But what makes a jobsite radio more appealing is that this material can come with a sturdy body and may project sounds a little further. These features are important when you’re in a loud work environment or a large space where it might take a bit of effort for sound to carry through a spot. These radio sets are also sturdy enough to handle even the toughest conditions you might get into. With all these points, it is time to look at some of the top choices you have for the best and loudest portable jobsite radios. Your first choice is this sturdy black and yellow model from DeWalt. This radio works on 12, 18, and 20V MAX battery packs. These are the same batteries that work on more than a hundred different DeWalt tools, so the odds are you might have some of these batteries already if you have DeWalt tools in your space. An AC/DC power feature is also included to help you run the radio off of a wall outlet. 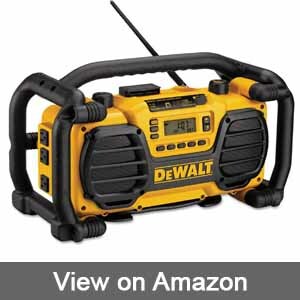 The design of this DeWalt radio offers a grooved grip on the top to help you carry it around well. The roll cage around the outside of the radio keeps it protected. A 3.5mm Aux input is included around the top to link this up to many outside devices. A USB port also included for when you’re looking to link a media player up, but the USB link is made mainly for allowing an outside device’s battery to be charged up. This works provided that the radio is plugged into a wall outlet. The USB charging feature is helpful for when you’re trying to link a portable media device onto the radio but you don’t want that device to run out of battery power. A small device storage box can be found on the side of the radio. The heavy duty storage compartment keeps anything you wish to use secured inside the radio. Your second option is this heavy duty Bosch radio. You can listen to music on this radio thanks to the two five-watt neodymium speakers. The neodymium magnet material takes in more power in a smaller space, thus producing clearer sounds. An auxiliary port is included on the radio to link to a media player. You can also link to one of ten preset stations on your radio dial. The seven-inch antenna lets you find stations in your spot in moments. The display screen lists the time of day and the radio frequency you are tuned to. The screen also lists details on anything else working within your setup. A small equalizer control is included on the main body. 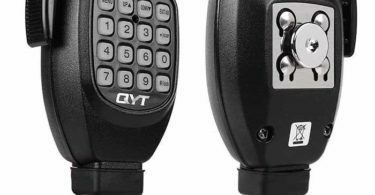 A large mute button is also included on the front part for when you need to stop the music during a meeting or other important occasion on the worksite. The radio works on an 18V Li-ion battery or through an AC adapter. The adapter itself is included with the radio set. The strong body also absorbs many impacts. The radio can be dropped from two meters up and it will still work without skipping or stopping. Your second DeWalt choice to find among portable jobsite radios is the DC012, a model that is slightly larger than the DCR018. 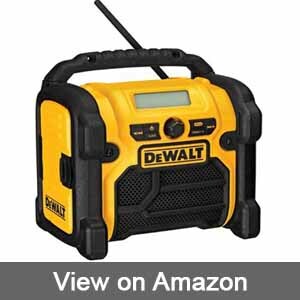 The DeWalt radio offers a one-hour port on the top to charge up a DeWalt battery pack from 7.2 to 18V in size with the exception of UniVolt batteries. A series of lines may be noticed on the display to help you see how well the battery is being charged up. A series of plugs can be found on the side of the radio to allow this to link onto many batteries and other outside items. The plugs can work for many tools on the worksite. The Aux port at the top lets you get a media player connected in no time. A small flat spot is included on the top to help you secure any media devices you are using here. 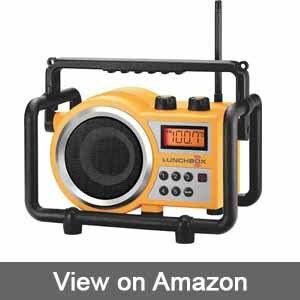 The LB-100 Lunchbox jobsite radio is much smaller in size than other portable jobsite radios. This is about 11.8 inches long and weighs a little under seven pounds. But you can get impressive audio quality off of this worksite radio. A single five-inch full-range speaker produces extraordinary volume in moments. Six equalizer presets are included while a Bass Boost feature ensures the more intense parts of the audio come out clearly. A rubber cable is included on the back end. You can roll up the cable on the back part to keep the cord from sticking out or being hard to secure after a while. You can also run this radio off of four C batteries if you don’t have access to an AC port. You might need to get a jobsite radio that works as both a traditional radio and as a PA speaker. The ION Audio Tailgater iPA77 is one such choice to use for this intention. 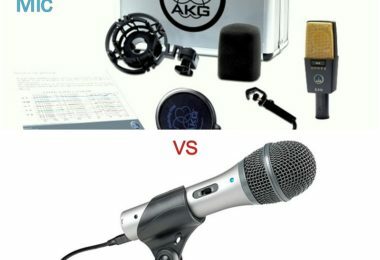 The iPA77 uses a 1/8” auxiliary input that links to a microphone. An auxiliary cable and microphone are included with the radio speaker. You can plug in the microphone and set up the proper input to allow people at the worksite to hear you or someone else speaking on the microphone. You can use this for cases where you need to make on-site announcements and you need people to clearly hear them. The microphone input goes right next to a basic auxiliary port. A Bluetooth link can be established between a mobile device and the speaker. The link lets you secure a wireless connection that plays back music from a device with crystal clarity. The digital display layout lets you know when the Bluetooth connection is working. 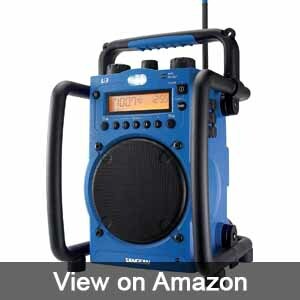 Your last choice to see for the best jobsite boombox is the Sangean U3. The brilliant design is housed inside a well-sealed body that is water-resistant. The dense shield over the speaker adds a good layout for use without risking water getting in the way and possibly hurting anything on the inside. You can get ten radio stations programmed onto the boombox. An auto-scan feature helps you find stations based on what the flexible spring antenna can find. A 6.5-inch 7W speaker provides a full range of sounds. The aux-in and stereo headphone jacks allow for easier usage of the radio. How can you power up a jobsite radio? You can get a jobsite radio powered up through either a battery or through a standard AC plug. The battery you use might include a rechargeable model, but you need to find an appropriate charger to get that battery to work for you. The battery must also be compatible with your radio. How big can the speakers be? The speaker or speakers on your radio can be around four to seven inches in size. A larger speaker will produce a greater amount of coverage in a large area, but you must watch for how the quality of the sound is laid out so you don’t have anything too hard to control or configure. What ports work on the radio? A radio may come with various ports including ones for mobile media devices and microphones. A radio can also include AC power ports that link the radio up to a wall outlet. Some models may also link up to other tools that can be powered off of the same battery used by the radio. You must watch for how well the battery is being used up if you wish to use the same battery for many items. How durable can a radio be? Some radio models are made with sturdy cages and other protective surface materials that keep a radio from breaking apart or having some of its components exposed. Some radio models are also sealed to keep dust, water, and other items from moving into the body. Review how well your radio model is laid out so you can ensure it will keep on working even in the toughest conditions. How much can one of these radios weigh? A radio may weigh around five to fifteen pounds. The total weight varies based on how well the radio is built and what features are included around its body. 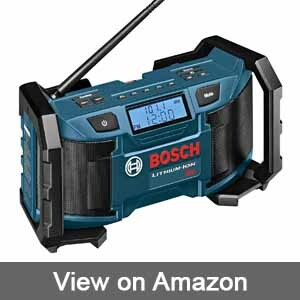 Our choice for the best of these jobsite radios is the Bosch 18-Volt or 120V Compact radio. This model works wonders for people looking to listen to music whether it is on the radio or through a mobile device plugged into an outlet. The convenient design and control feature also helps you get the most out of the controls and adjustments you wish to make. The ability to work with a sturdy 18V Bosch battery or a 120V wall connection helps too. Whatever you choose, you must look at how well the best and loudest jobsite radio options are for your needs. You will be impressed with how each of these jobsite radios can work for the connectivity and entertainment desires people have at a working environment. What Will You Get From the Best Ham Radio For Beginners?